Hey there Fight Fans! 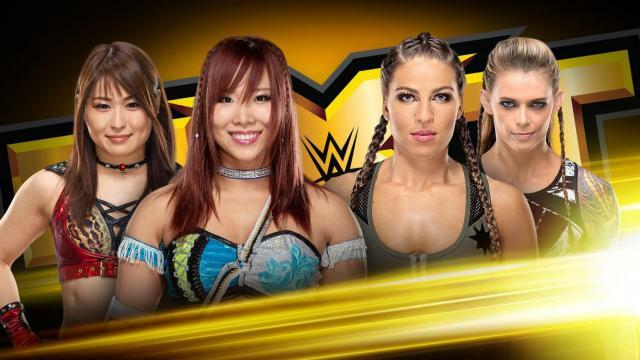 Welcome to our coverage of tonight's edition of WWE NXT! You can leave a comment below during the show, and if you're looking for exclusive content check out premium service Fightful Select! -We open the show with a video package for NXT Takeover: Phoenix from this past Saturday. Io and Marina start the match with Io countering everything Marina does before dropkicking her and tagging Kairi as Duke gets the tag. Kairi and Jessamyn roll around until Kairi hits a huricanrrana into a roll up for a quick two count. Io and Kairi hit a double dropkick and Io hits knees in the corner and Duke trips Io on the apron before Marina comes in and takes Io down for a quick two count. Duke kicks Io in the midsection and locks in a butterfly hold before hitting a butterfly suplex for a two count. Io counters a front choke by walking up the turnbuckles and hitting a shiranui before tagging Kairi in. Kairi hits a series of jumping neckbreakers and hits a spear into a sliding forearm in the corner. Io then dropkicks Duke off of the apron before Kairi hits a pop-up elbow drop before Io hits a suicide dive and Kairi hits the Insane Elbow for the pin and the win. Winner: Kairi Sane and Io Shirai defeat Marina Shafir and Jessamyn Duke when Kairi pins Marina with the Insane Elbow. -We get a video package for the NXT Women's Championship Match and an interview with Bianca Belair afterwards before we get a recap of the NXT Tag Team Championship Match and the War Raiders commenting on their new reign as champions. -We come back from commercial to a recap and post interview for Kassius Ohno and Matt Riddle and NXT champion Tommaso Ciampa and the challenger Aleister Black. -We get a video package for the announcement of Half Time Heat this weekend. Angelo starts the match he and Montez clear the ring and they double team Blake before he comes back with a clothesline and tags in Cutler who hits a backbreaker and a high angle suplex. FS double up on Ford with a double backbreaker for a two count before Cutler locks in a rear chin lock that Ford fights out of before getting bucklebombed for his troubles. Ford clears the ring and tags in Angelo who takes out both members of the Forgotten Sons and spears Blake for a near fall. Street Profits hit an electric chair blockbuster for a near fall before Ryker takes out Ford at ringside and Blake hits a suicide dive when he gets distracted. Forgotten Sons then hit Angelo with the Memory Remains. Winner: Forgotten Sons defeat Street Profits via pinfall when they pin Angelo with the Memory Remains. WWE Smackdown! Live Results 10/31 Shinsuke Nakamura vs Kevin Owens, AJ Styles vs Samir Singh & More!